If you have an issue with chrome, like getting allergic reactions to the eye blistering stuff, or worse, this is yours. This kit is complete, but stock switches must be re-used. Apart from the gone-is-chrome color this MCS 900557 kit will upgrade your cable operated clutch to a hydraulic clutch system, with no additional parts required. Easy to install and nothing more to wish. 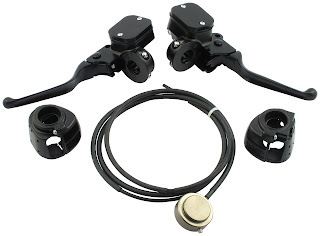 Fits 96-06 Softail, Touring 5-speeds and 96-05 Dyna 5-speed models. Give your local Motorcycle Storehouse dealer a call for more information.